The news came just a day after the President stunned the Republican party by abruptly siding with Congressional Democrats over the best way to deal with current debt ceiling negotiations. These developments should make it clear, as I described in the weeks after Trump moved into the White House, that budget deficits during the Trump administration will be far larger than just about anyone predicted. In fact, the self-proclaimed “King of Debt” is reaching for his crown and the coronation profoundly affect the fate of the U.S. dollar and the American economy. Trump came to the White House with essentially no history of stated aversion to government spending and debt accumulation. Instead, he won the votes of Republicans and some independents by staking out extreme positions on immigration, terrorism, and economic nationalism, and by thumbing his nose at a political establishment much deserving of ridicule. Unlike almost all other Republicans, he had nothing to say about fiscal prudence, limited government, entitlement reform, spending cuts, or balanced budgets. In fact, he very rarely criticized government for being too large, but simply for being too stupid. In fact, voting to raise the debt ceiling was always politically embarrassing for Republicans. To provide cover the measures were usually pared with some other politically popular legislation. In many cases some Republicans would be given the nod from leadership to vote no, as they could cast their votes against it knowing it would pass anyway. But eliminating the ceiling makes it that much easier for Republicans to campaign one way and govern another. The chart below doesn’t show a stock, a commodity, or even a high-flying cryptocurrency. Instead, it depicts an unstoppable trend that most investors have never even thought about. See for yourself. You’re looking at the percentage of people living in the United States who are 65 years of age or older. You can see that the number of seniors in the United States is about to explode. This may not seem like a big deal to the casual observer. But it’s going to have profound investment implications. That’s a bold statement. But Pal knows what he’s talking about. He used to run hedge fund sales at Goldman Sachs. He later comanaged the GLG Global Macro Fund, one of the world’s biggest hedge funds. Pal made so much money by the age of 36 that he stopped managing outside money in 2004. But he didn’t completely retire. Today, Pal writes the Global Macro Investor newsletter, one of the world’s most exclusive investment newsletters. His readers include hedge fund managers, sovereign wealth funds, and pension funds. In short, Pal is one of the world’s top “big picture” thinkers. It pays to listen to him. Pal isn’t the only big-league investor who thinks this is a big deal. Bill Gross is also deeply concerned about America’s aging population. Gross is one of the world’s leading bond experts. He used to run PIMCO, one of the world’s largest money managers. Today, he manages about $1.9 billion at Janus Capital. Yusko is another Wall Street legend. He manages $1.6 billion at Morgan Creek Capital. Like Pal and Gross, Yusko thinks demographics will drive stock performance for years to come…and not in a good way. He thinks bad demographics will be one of three “killer D’s” facing the U.S. economy. The other two “D’s” are debt and deflation, which are another way of saying slow economic growth. They didn’t climb to the top of Wall Street by thinking like other investors. They got there by being original thinkers. And yet, they’re worried about the same thing: America’s aging population. Of course, they have good reason to be. Japan’s population exploded after World War II. This triggered a huge economic boom. It became one of the world’s most advanced economies. Then, everything came undone in the early ‘90s. Japan’s economy imploded and entered a vicious downturn. Times were tough. So, many Japanese people stopped having children. And that’s left huge scars on its society. It was also the first time on record that less than 1 million babies were born in Japan. Meanwhile, the number of deaths in Japan hit a record high of 1.3 million. Japan’s rapidly aging population is killing its economy. Just look at this chart. It shows Japan’s annual economic output over the last two decades. 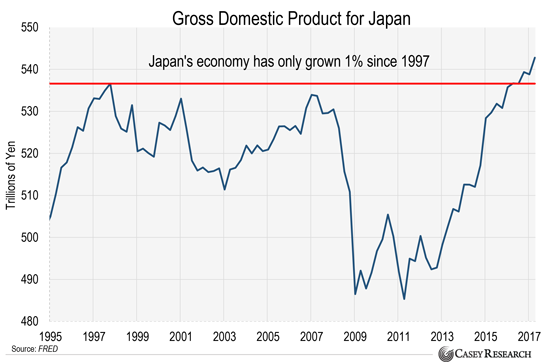 You can see that Japan’s economy has barely grown. It’s only 1% bigger than it was in 1997. 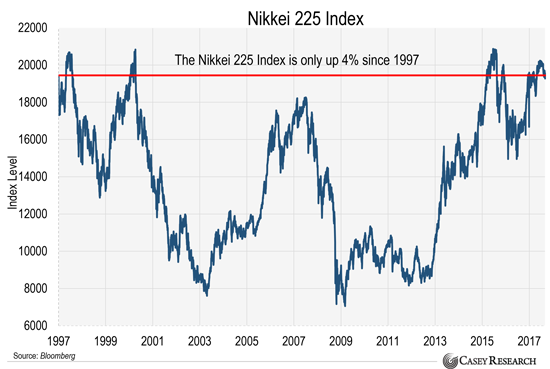 This chart shows the performance of the Nikkei 225, Japan’s version of the S&P 500, since 1997. The Nikkei is up just 4% over this period. In other words, Japanese stocks have been “dead money” for the past two decades. 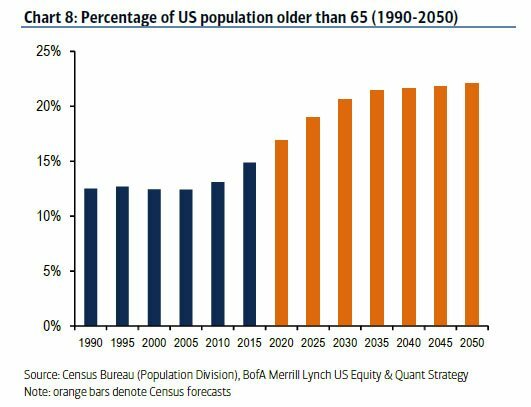 By 2030, more than 20% of the U.S. population will be at least 65 years old. That’s up from about 15% today. By 2050, the U.S. will have twice as many seniors as it does today. And many of these people will retire. They’ll stop producing for the economy. They’ll also buy fewer godos and services. That’s what happens when people retire. Seniors spend about 38% less on consumer goods and services than people in the workforce. After all, consumption makes up 70% of the U.S. economy. So, the economy could take a major hit if millions of people start buying fewer goods and services. If that happens, U.S. stocks could come crashing down, too. But demographics in the U.S. are certainly getting worse. There’s no denying that. And there’s nothing the government can do to stop it. The trend is in motion. Lighten up on U.S. stocks. Now, I’m not saying you should hit the panic button. But now is a good time to reduce your exposure to U.S. stock holdings. You can start by trimming your stake in risky U.S. stocks. You should also allocate less money to U.S. stocks going forward. If you take these steps today, you’ll be miles ahead of most investors. BERLIN – US President Donald Trump’s nearly eight months in office have been characterized by a series of disturbing political developments. But Trump is not entirely to blame. His presidency is just the latest act in a long-running political tragedy. From a foreign-policy perspective, the problem began in the 1990s, when the United States squandered the post-Cold War peace dividend. With regard to domestic policy, the failures began even earlier: from Reaganomics in the 1980s to Obamacare in the 2010s, major policies have often overpromised and underperformed, while failing to address underlying problems. Of course, US politicians are rarely short on lofty rhetoric – from Ronald Reagan’s “Morning in America” campaign to Barack Obama’s “Yes, we can” slogan to Donald Trump’s “America First” refrain. And, beginning with John F. Kennedy, presidents have likened the US to a “city upon a hill” – an example to the rest of the world. Yet it is hard to remember the last time the US produced a policy that could serve as a model for others to emulate. The country has not had a pro-active, forward-looking government since the 1960s. Since the 1990s, it has not invested sufficiently in human capital to meet the fast-changing economy’s shifting skill requirements; undertaken no effective education, environmental, or labor-market reforms; and launched no new urban initiatives or future-proofing infrastructure policies. The list goes on. The reason is simple: Americans’ longstanding suspicion of “big government” morphed into a kind of political self-hatred, with policymakers and citizens alike led to believe that government is at its best when it does not govern. And, as the US government has retreated from society, the US has retreated from the rest of the world. These trends have culminated in Trump, whose most popular policies focus on destruction, rather than creation. Deregulation will supposedly slay the “deep state” chimera, while enabling the US to achieve energy independence. A US-centered foreign policy focused not on reshaping America’s role in the world, but on reducing it. From the Affordable Care Act (Obamacare) to the Deferred Action for Childhood Arrivals (DACA) policy, Trump likes to reverse past policies, without devising anything to replace them. American conservatives have so far failed to read Trump’s intentions accurately. In July, Robert W. Merry wrote that Trump had “yet to score anything approaching a serious legislative victory – or to demonstrate any serious political momentum.” But the truth is that Trump’s agenda has plenty of momentum; it is just focused on demolishing Obama’s legacy. The result of Trump’s approach is that America’s existing problems are worsening and huge opportunities are being missed. But what can stop demons already unleashed? And, even if they are stopped, can the damage they have already wrought be reversed? There was some backlash against Trump when he failed to condemn clearly the white supremacist demonstrators in Charlottesville, Virginia, whose “Unite the Right” rally in August ended with the murder of a counter-protester. But it has done little to weaken Trump’s destructive momentum: just a few weeks later, Trump announced his plan to end DACA, a policy that protected from deportation some 800,000 young immigrants who were brought to the US as children. Beyond lamenting the astonishing depths to which a great political culture and system can fall, what can be done? One obvious option, which Democrats largely seem to be taking, is to reject Trump and everything his administration stands for. But that risks ensuring the persistence of the dysfunctional dynamics that brought the US to this point. Another option, however unappealing at first glance, is to accept the Trump administration. The result of such a choice may well be the worsening of domestic problems and the weakening of checks and balances. But it is also possible that checks and balances will hold until the next election, enabling America’s existing political parties to rebuild and new parties to emerge. The result, one hopes, would be a much-needed political realignment – indeed, a political renaissance. To be sure, such a shift would take time – time that, depending on how long Trump remains in office, parties may not have. Republicans may be politically handicapped for years, as they are forced to reckon with the Faustian bargain they struck for the sake of political power. Democrats, for their part, face a broad leadership vacuum and a lack of political vision, owing to their now-internalized fear of being labeled “big spenders.” And, as it stands, no third parties or candidates provide reasonable alternatives. Nonetheless, there are encouraging signs that some Republicans and Democrats are thinking outside the party box. More must follow suit, recognizing that realigning the existing party system may be the only way to break the stalemate of US politics and, potentially, reverse decades of dangerous democratic underperformance. The next act in America’s political drama, following the 2018 congressional midterm election, could be marked by a kind of reckoning, with the 2020 presidential campaign accompanied by civic breakdown and the escalation of violent confrontation that has lingered beneath the surface for years. To rewrite the plot before that scenario plays out requires reshuffling and revitalizing US politics, so that, in the words of the poet Seamus Heaney, “hope and history rhyme” once again in America. I spent the past two weeks in Canada, north of a town called Nelson in British Columbia. One evening, while nearing sleep, I heard a rumbling that sounded like a train. In the morning, I woke and people were taking about an enormous fireball that had passed overhead. The rumbling had been the result a meteor crashing to Earth.